Enderly Supports the Village — Enderly Coffee Co.
U2’s Bono dates me, but his words are timeless - “When [we] finally accept that ‘those children’ in some far off global village have the same value as [us] in God’s eyes or even in just [our] own eyes, then [our lives are] forever changed; you see something that you can’t un-see.” And instead of ‘those children’ what about the children in our own city of Charlotte? They’re waiting in foster families for decisions. They’re waiting in courtrooms for hearings. They’re waiting to be held, to feel included. Foster Village Charlotte was founded to connect foster families who wait alongside these children - lovingly holding hands, wiping noses, brushing teeth, feeding bellies, finding costumes, signing paperwork, carpooling to school, supervising visits. And like in Becky and Tony’s situation, these foster families may not even know there are other families with foster children only a few doors down - they’re all waiting. There are over 600 children in foster care in Mecklenburg County, yet multiple agencies place them and certify foster families, so finding one’s way through the muddled web of agencies and resources is sticky, messy and requires time, which foster parents (as you can imagine) don’t have a lot of! Enter —— Foster Village Charlotte, a group of people wrapping their arms around one another, and they need others lifting them up. 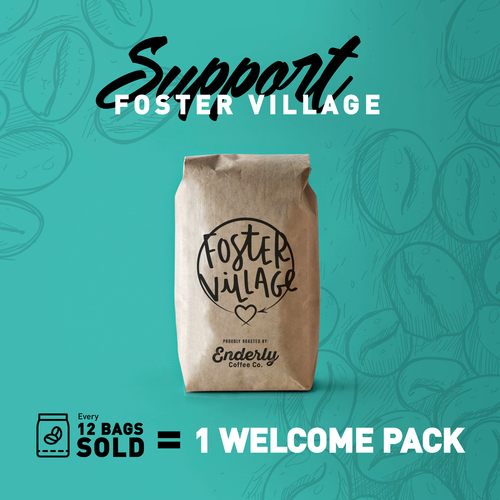 Enderly is committed to financially supporting Foster Village Charlotte this month with every FV bag of beans sold, 100% of the proceeds go to help support foster children and their foster parents who are boldly opening up their hearts and homes to children waiting for their forever homes or just to go back to their forever homes. Foster Village is life - foster village is sacrifice - foster village is community - foster village is love. Enderly’s values align with FV’s; therefore, we’re honored and thankful to support Foster Village during the month of November. Thank you, in advance, for helping us help them. You can find a bag of Foster Village beans stamped and ready for pick up in our shop or buy online here.